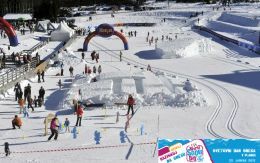 On Sunday 22nd of January PLANICA – main Slovenian World snow day venue - experienced a real snow show for children. In sunny valley of Ponce it all began at 9 o'clock in the morning. Hundreds of children along with Franci Petek - ski jumping World Champion, ambassador of the Nordic World Ski Championships candidacy 2017 and big supporter of Planica tale - first opened event scene called Snežna dežela (Snow Land). Snežna dežela/Snow Land offered many activities. Attention was mainly on nordic disciplines, cross-country and ski jumping. Planica tale has been successfully initiated. Under supervision of Franci Petek children have been testing real beginners jumping skies, made especially for World Snow Day by Elan. Others have been running as Petra Majdič, the best cross-country athlete in the history of Slovenia, three times winner of the small crystal globe, the winner of the silver and bronze medals at World championships and Olympic bronze and an ambassador of the Planica 2017 candidacy. Both main Nordic ski disciplines have been carefully guided by an experienced team of instructors and trainers Ski Club Triglav Kranj. Snežna dežela/Snow Land was filled with other snow activities as well. Children had a chance to compete in special version of ice hockey, explore and seek out the snow maze and toboggan. More creative ones designed various snow sculptures. Snežna dežela/Snow Land had also activities for the youngest, they enjoyed and explored in kids area. The Planica tale is far from over. The activities of World Snow day project will continue until 20th of February 2012. Snežna dežela/Snow Land will host more than 1000 pupils as part of their school program. Part of the idea was to invite Slovenian Nordic clubs to participate and to share their knowledge with pupils. We are grateful to all the traniners and coaches of Nordic Society Rateče, SK Triglav Kranj, TSK Jub Dol pri Ljubljani, SSK Costella Ilirija and SD Dolomiti. First responses from primary school teachers and pupils were extremely positive. The project and activities were well accepted. Franci Petek: "CONGRATULATION and THANK YOU. You've helped us make a memorable day for the kids and us." "Winter sport day is very important for us and kids, therefore we are very proud to be the first school to participate and join the great idea where our pupils could explore, enjoy and experience the snow. Our kids were very excited and happy, trough game they managed to learn basics of both Nordic disciplines, cross-country and ski jumping. Thanks to Ski Association of Slovenia and OC Planica for hosting us. Thanks go also to all the trainers and coaches." Marko: "The best sport day ever. So cool, so fun." Špela: "My favourite activity was ski jumping." Alen: "Snežna dežela/Snow Land rocks." Maja: "I didn’t fall over while running on skis, yeeeeeeaah." Because of all the happy faces, positive comments and great experience we will give a big effort to continue in 2013. In the mean while Planica tale will continue with FIS World Cup Ski Jumping Final from 15th till 18th of March. In the year 2014 we will open the first Nordic centre in Slovenia and in 2017 we will hopefully host the Nordic World Ski Championships.